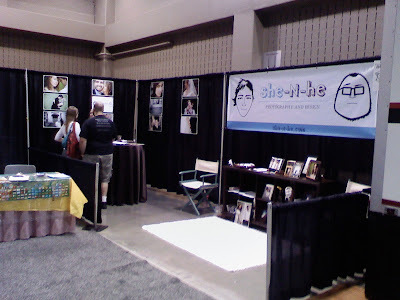 June has come to a close and I realized today that I never put anything up about the Bridal Extravaganza. It was a little over a week ago at the Palmer Events Center, here in Austin, Tx. 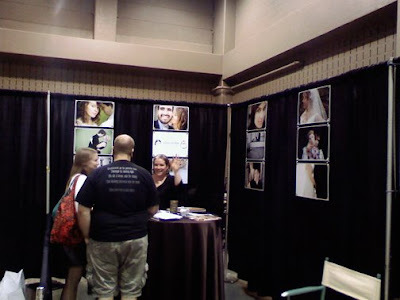 It's a huge bridal fair held 3 times annually. I know for brides it can be a bit intimidating, I understand that, but I LOVE them!!! I really do. It gives me the chance to get in front of a bride and really show her how much I love what I do and how our work will fit into your dreams of the perfect wedding. It makes me a little teary ;) that's for you Samantha. Steve and I worked the event together, he is the perfect carnival barker and I am great at having passion for our product. Together, as in life, we are a perfect team. 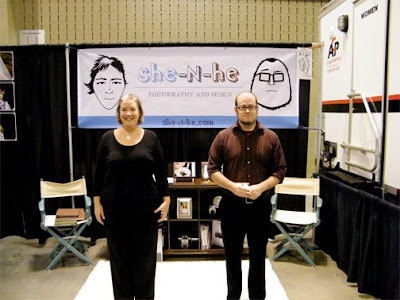 Here are some pictures of us and our booth, course I forget, or rather, chose not to bring my stinkin' camera.